For the Maasai, cattle are what make the good life, and milk and meat are the best foods. Their old ideal was to live by their cattle alone – other foods they could get by exchange – but today they also need to grow crops. They move their herds from one place to another, so that the grass has a chance to grow again; traditionally, this is made possible by a communal land tenure system in which everyone in an area shares access to water and pasture. 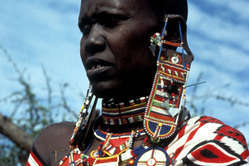 Nowadays Maasai have increasingly been forced to settle, and many take jobs in towns. Maasai society is organised into male age-groups whose members together pass through initiations to become warriors, and then elders. They have no chiefs, although each section has a Laibon, or spiritual leader, at its head. Maasai worship one god who dwells in all things, but may manifest himself as either kindly or destructive. Many Maasai today, however, belong to various Christian churches. One threat to the Maasai has come from from game hunters in the Loliondo region of northern Tanzania. Here, Maasai villages have been burnt to the ground by the authorities, and thousands have brutally evicted to provide a company, Otterlo Business Corporation Ltd (OBC), with more access to land for game hunting. Most of what used to be Maasai land has already been taken over, for private farms and ranches, for government projects, wildlife parks or private hunting concessions. Mostly they retain only the driest and least fertile areas. The stress this causes to their herds has often been aggravated by attempts made by governments to ‘develop’ the Maasai. These are based on the idea that they keep too much cattle for the land. However, they are in fact very efficient livestock producers and rarely have more animals than they need or the land can carry. These ‘development’ efforts try to change their system of shared access to land. While this has suited outsiders and some entrepreneurial Maasai who have been able to acquire land for themselves or sell it off, it has often denuded the soil and brought poverty to the majority of Maasai, who are left with too little and only the worst land. Since 1993 Survival has assisted several Maasai groups in their struggle for their land. In Kenya we found funds for a programme of consciousness-raising against land sales, and supported the people of Iloodoariak and Mosiro, who are resisting the theft of their land through a legal fraud. In Tanzania, we have backed the demand of the Maasai of the Ngorongoro Conservation Area for a proper say in its administration, and supported attempts to defend the sacred hill Endoinyo Ormoruwak (‘hill of elders’). Survival is supporting the Loliondo Maasai’s demand to return to their lands in Loliondo and their call for an independent investigation in to the violent evictions they have suffered.